This post comes as a result of reading Ulf DK5TX’s blog regarding the TS-590SG – I was surprised to hear that there was a possibility of my 590 being not quite right. The issue relates to the pair of cooling fans which site behind the front panel. They are meant to pass air from vents under the radio and into the PA stage. Unfortunately, and despite the fans having arrows on them indicating the direction of rotation and air-flow – on some batches of TS-590SG they have been installed the wrong way round. My own radio is from the B5C batch which indicates a December 2015 model and one of those mentioned in Ulf’s blog. Curiosity got the better of me so I decided to take a look inside – low and behold: Fans that appeared to be installed backwards! The picture below shows the view from the front of the radio – notice the directon of the arrows: Air blowing AWAY from the inside of the radio, with the fan rotating clockwise. I was uncertain about the issue of the fans so wanted to speak with my local dealer and hear the official response myself – Luckily, they are only 10 miles away so a visit for whatever reason isn’t too difficult. After explaining the above, the guys at Waters & Stanton confirmed that Kenwood know about the fan problem and a free fix was offered – With nothing better to do I took it down there today and went off to enjoy a festive coffee at the local Costa. Upon returning half-an-hour later it was all fixed. Confirming the status of the fans isn’t too hard – you may actually be able to feel the air blowing out by placing your fingers underneath the radio. A visual inspection requires the removal of the top cover: Screws on the side and top are removed and you can prize the lid off and note the direction of the arrows on the fan cases. If they are pointing to the front of the radio – they have been installed incorrectly. There is a PDF guide which details the cooling-fan fix (you need to hinge the front-panel down to get to the main chassis) – but a warranty (or a free fix ‘cos it was broke anyway) job gives me peace of mind that the radio will continue to perform as it should. Additionally, I decided to hand over some money and get the extended transmit modification performed which I had not bothered with at the time of purchase back in April. This now gives me access to 5MHz which is a new band for me – it’s available to “Full” UK licence holders so I’m now good-to-go, as they say. The 60m band is quite a new thing, and many radios don’t do it “out of the box” so an extended transmit mod is usually required – this typically involves the removal of 1 or 2 surface-mount resistors to alter the radio’s configuration, ie: telling its CPU that it’s either in a different Country or can transmit “anywhere”. This, unsurprisingly, wasn’t a free option, but given the size and location of the resistor, along with my lack of SMD experience (and soldering tip), I consider the £25 service charge well spent! In my limited excursions onto 5MHz, I’ve heard some activity and it seems to be a sanctuary for those who like a quiet local(ish) chat – obviously sharing propagation characteristics of 3.5MHz and 7MHz. 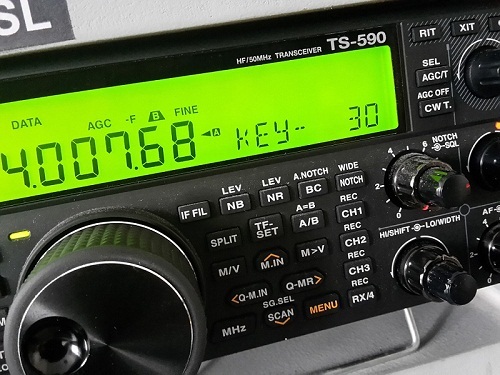 My primary interests will be CW and Datamodes, and with the rather strict frequency allowances on 5MHz, plus the TS-590SG now capable of transmitting anywhere, I need to ensure that I only park where I’m allowed to!